High definition 1080p with 99° wide angle coverage. Night vision up to 100 feet or 65 feet in total darkness. Powerful 8 Channel NVR records all video to a built-in security-grade 2TB hard drive. 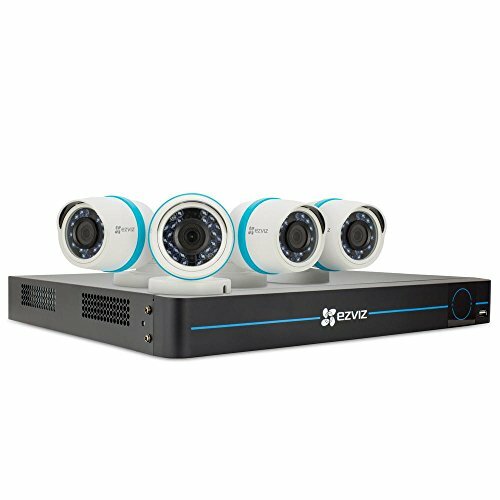 4 included cameras with 8 total available channels. Easily add up to 4 additional EZVIZ cameras as you need them. Each camera in the IP kit can be powered and connected with one Ethernet cable. The kit’s NVR comes with PoE ports on the back so all you have to do is plug in the NVR and connect the cameras. PREMIUM SMART HOME IOT SURVEILLANCE STARTER KIT – Easily add up to 4 additional cameras with 8 total channels available and a built in 2TB security grade hard drive. SIMPLE PoE INSTALLATION – Power and data transmitted to your cameras through a single network cable for a true Plug-n-Play experience. Move, change, or upgrade your existing network without hassle. CUSTOMIZABLE MOTION DETECTION – Detection area can be customized from your NVR to minimize false alarms. Any movement will be recorded and notification will be sent immediately to your smart phone. SAFEGUARDED AND RELIABLE – Cameras are certified IP66 and capable of operating in extreme temperatures outdoors. Multi-layer security and end-to-end video encryption protect your data. FLEXIBLE AND FUTUREPROOF – EZVIZ NVR’s now have the ability to connect ONVIF compliant cameras making it easier to upgrade existing surveillance networks. Please ensure product firmware is up to date.